Searching for functional swag to giveaway at your next company event or trade show? Promotion Pros is the top place online to buy custom crayons for potential customers who visit your booth or table. We are stocked to the brim with crayon packs for children, so when you pass them out, you'll be sure of long term brand exposure. Custom pencil sets will attract potential customers to your table or booth with their design and functionality - and will please the kiddies. With promo crayons ranging from boxes of colorful crayons to wooden pencil sets, you're bound to find the perfect product to promote your kid-friendly brand. Our 12-Piece Colored Pencil Tin allows easy storage of color pencils after use. 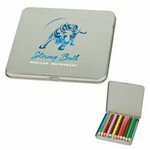 It is made up of Metallic tin box with 12 colored pencils and imprint method options for complete customization. Get the creative juices flowing with a coloring break using a 4 count crayon pack! 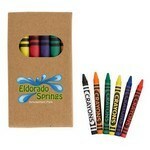 The 6- Piece Crayon Set include colors: Black, Blue, Green, Orange, Red, and Yellow. Get the creative juices flowing with a coloring break using a Color Pencil Set in Tube with Sharpener! Get the creative juices flowing with a coloring break using a Six Color Wooden Pencil Set in Box!